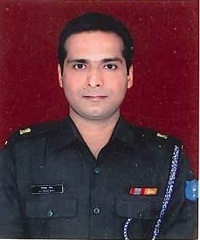 Major Nitesh Roy was born and brought up in Ranchi in Jharkhand. After completing his education, he joined the Indian Army in 2001 and was commissioned into Army Education Corps (AEC). 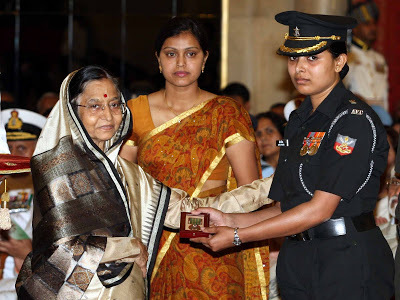 He was married to Captain Seema Mishra, who also worked as an officer in Army Education Corps. After serving in various Army bases for few years, he was deputed to serve as part of an Amy contingent in Kabul in Afghanistan in the year 2009. A committed soldier and a fine officer, Maj Nitesh Roy was admired by his peers and juniors as well. As part of Indian government’s effort to help war-ravaged Afghanistan, the Indian Army sent a contingent in the year 2010. Maj Nitesh Roy was part of that contingent, which was mandated to provide humanitarian medical assistance and also educate Afghan Nationals in various subjects. Maj Roy was staying in a guesthouse ‘Noor’ along with other members of the team. In the early hours of February 26, 2010, the guesthouse was attacked by the heavily armed suicide bombers and terrorists. Initially, they blew an explosive-laden vehicle by IED, to cause maximum damage. This not only killed the guards, who were patrolling the perimeter and guest house’s owner, but it damaged the compound wall too. Soon thereafter the militants entered the rooms of the guesthouse and started throwing grenades and firing at the unarmed Indian soldiers. Standing up to the challenge in the face of certain death, unarmed Maj Nitesh Roy along with his buddy crawled out of the debris of their respective rooms and rushed towards the rooms occupied by the other three officers and directed them towards a bathroom located in the innermost corner of the guesthouse. Their hiding place was by then set ablaze by grenade attacks and their belongings caught fire. Maj Nitesh Roy exhorted the other officers to move out of the burning rooms. While helping others Maj Nitesh Roy himself sustained burn injuries. He suffered more than 40 percent burns and was airlifted to Army’s Research and Referral (RR) hospital in Delhi. However, his condition deteriorated over the next few days and he was eventually put on a ventilator. His wife, also an army officer posted at the Indian Military Academy (IMA) that time, was by his side in the hospital. After being badly injured in the deadly attack, Maj Nitesh Roy had told his friends that he wanted to live for his two-year-old daughter who was waiting back home in India. However, Maj Nitesh Roy’s condition did not improve and succumbed to his injuries on 3rd March 2010. Maj Nitesh Roy displayed exemplary courage, grit, determination, and valour beyond the call of his duty, following the highest tradition of the Indian Army. Maj Nitesh Roy was posthumously honoured with “Shaurya Chakra”, India’s third highest peacetime gallantry award, for his conspicuous bravery and supreme sacrifice. Major Nitesh Roy is survived by his wife Captain Seema Mishra and daughter Vaishnavi. Major Nitesh Roy was deployed to Kabul as part of the Indian English Language Team. In the early morning of 26 February 2010, a well guarded residential compound housing six Army medical officers, four par, medics and two other Army officers were attacked by heavily armed and determined terrorist suicide bombers. The attack was initiated by the detonation of a suicidal vehicle borne IED at the boundary wall resulting in the instantaneous death of three security guards and total collapse of the boundary wall and the residential compound. A grenades and subjecting it to volleys of Kalashnikov fire, thereby catching the unarmed occupants by total surprise. The terrorist then started room to room search for any sign of survivors. Standing up to the challenge in the face of certain death, unarmed Major Nitesh Roy along with his buddy crawled out of the debris of their respective rooms and rushed towards those of the three officers on one side of the guesthouse and directed them towards a bathroom located in the inner most corner of the guesthouse. Their hiding place was by then ablaze because of grenade attacks and their clothing was on fire. When the terrorist finally blew up his suicide vest as a result of the heroic act of another officer. Major Nitesh Roy exhorted the other officers to move out of the burning room. In doing so he himself sustained the major brunt of the fire. He later succumbed to his injuries. Major Nitesh Roy displayed exemplary courage, grit, determination and valour beyond the call of duty and made the supreme sacrifice in the face of a terrorist suicide bomber attack. I still remember those bicycle rides. We used to go for Physics and Chemistry tuition and later get into a debate on politics. I admired him for his strong character, logical reasoning and the smiling self-confidence with which he carried himself, 6ft’3 and taller than me! Both of us were preparing for Engineering exams including IIT-JEE, hoping to clear them. That’s what you eventually do in Bihar! You gun for an Engineering Degree or later go to Delhi to prepare for an IAS/IPS exam. I guess in our 2nd attempt at entrance exams post 12th, we realized that cracking the IIT code wasn’t our ballgame! He had something else, destined. Nitesh started preparing for other exams. Yes, his sound judgment, logical reasoning and self-confidence the utmost he had in him, helped him crack this code. I was very thrilled to hear that he had joined the Indian Army , but we lost contact. It’s our karma that takes us places. It was only when a common friend and I met in London in 2011, I asked him where Nitesh Roy would be posted now? He told me, that Nitesh went on to become Major Nitesh Roy and was posted in Afghanistan and is no more!!! I am reminded of the self-confidence and guts he showed in schooldays!I shall never forget those debate, arguments and our cycle ride back home. In this age of selfies, I miss having clicked one snap of ours together, wish we had easy access to camera or mobile those days, but so long am alive, will always remember you. All those selfies are etched in my memory, you will always remain a hero, my friend. Hi Nitesh, it’s nine years now. We miss you. Uncle is alone after your Mom passed away. He misses you a lot.